Let me explain the snapshot in more detail. The time period for this snapshot is from July 9th to July 13th. Total leads collected was 46 (this includes full name, address, phone number, and email address). Total people reached by this specific ad was 23,928. Total cost per lead acquisition was $10.65. Total amount spent was $490.06. The 46 leads were given to the HVAC company’s sales team and they went to work. The company signed two new customers on brand new AC installs. Please keep in mind several factors went into this. July has been a very hot month so far this year in Los Angeles. The company has an amazing sales team as they spend thousands on educating their sales staff. The sales team also has four upcoming 2nd appointments with the potential new customers. At the end of the day if they close two more leads into sales they will make a decent profit and they would have gained 4 new customers. In conclusion, Facebook marketing works great for HVAC companies. 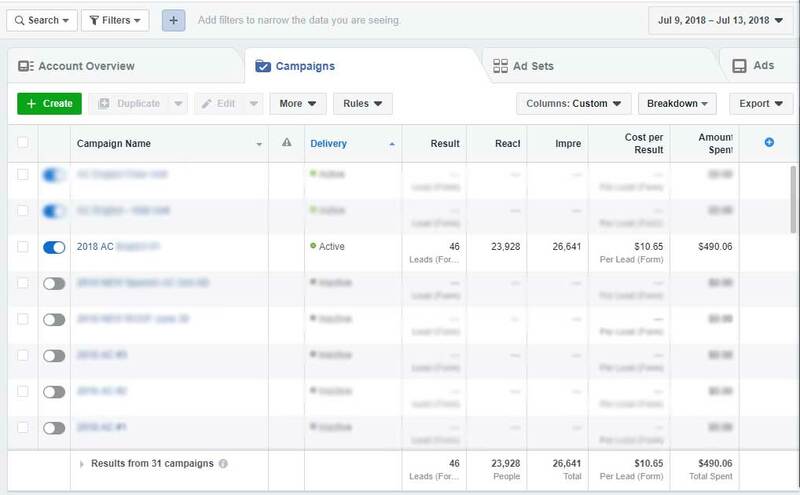 Most of your competitors are already using other avenues of marketing such as Google PPC, Yelp, Angie’s List, and Home Advisor but very little are using creative Facebook Ads and sales funnels. If you would like a free marketing analysis for your HVAC company you can contact us here.